ATD will implement the proper network cabling system for your business. Network Cable Testing, the physical and electrical testing of Network cabling, requires a specialist. As a Network Manager you have to deal with cable faults, broken wires, incompatibilities and a host of other cable related issues. What can you do? What do you need to test for? 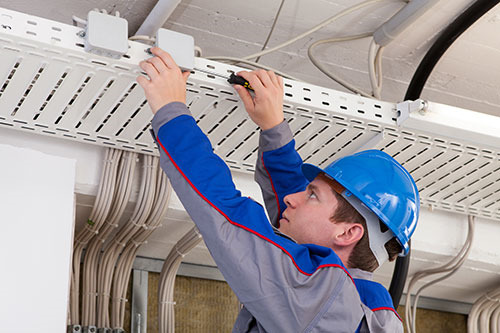 The design and installation of network cabling can be extremely complex. A whole host of factors have to be taken into account, network speed, length of cables, avoiding architectural features or electrical interference, and many more. You may not be able to justify the cost of the specialist testers used by cabling professionals, but a simple testing kit will allow you to check for the most common problems, save you time chasing phantoms, and help you resolve issues faster and more efficiently. ATD’s experts can ensure common issues will be minimized. Many established networks contain a mixture of old and new cables, but which are Cat 4, Cat 5, or Cat5e. Sometimes when networks are upgraded older patch cables are left in place. Just because a cable was fine on the old network does not mean it will work on the new upgraded network. It can be hard to identify these faults without some kind of test kit. Something that reports network speed is very useful. Link testing can be used to identify the network speed. It’s useful to find out additional network information using DHCP. These issues along with proper cable length, wiremapping, and connectivity testing, ATD has encountered it before and will coordinate the proper solution for your business.